Late 18th-century English red morocco in brown morocco case lettered: The Gloucester Abbey Hymn Book and Horae - English Ms. on vellum - c. 1430. Found underneath the floor at Linsted Lodge and given (1785) by Lady Teynham to Lord Dacre; collection of Sir Thomas Barrett Lennard; William Morris; Richard Bennett (purchased from Morris's estate, 1897); Catalogue of manuscripts and early printed books from the libraries of William Morris, Richard Bennett, Bertram, fourth Earl of Ashburnham, and other sources, no. 95; purchased by J. Pierpont Morgan (1837-1913) with the Bennett Collection in 1902; J.P. Morgan (1867-1943). 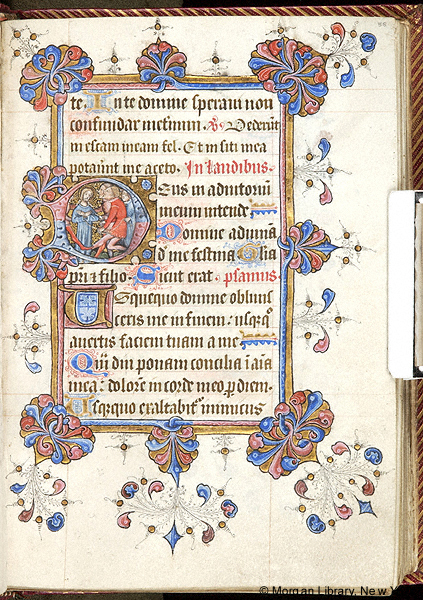 Ms. book of hours for the use of Gloucester; written and illuminated at St. Peter's Abbey, Gloucester, England, ca. 1405-1415. Decoration: historiated and numerous illuminated initials by 3 illuminators, numerous borders by 4 illuminators, all working in close association. Artists: various artists among whom are two artists of Oxford, Oriel College MS 75, one of whom has been named by Kathleen Scott the Oriel 75 Master.